Until now, the Oculus Rift and HTC Vive have battled it out over the PC virtual reality space, though Valve has made no secret of the fact its partnership with HTC wouldn't stay exclusive. At GDC 2017, it announced the next company that will build on its SteamVR platform: LG. The two have been working together since the end of 2015 and now they're ready to show off the goods. Tucked away at the back of Valve's GDC suite, I was treated to a demo of the new headset, which is still in the prototype phase. Richard Taylor, an LG assistant research engineer, told me that the resolution and weight will probably change by the time this thing launches. When that will be is still unclear, but we'll know later this year. First, let's talk specs. The LG headset crams in a 3.64-inch diagonal display with a 1440 x 1280 resolution per eye, a refresh rate of 90Hz and a 110-degree field of view. That puts it a little higher than the Vive and Rift on resolution, but otherwise it's neck and neck, and from my 15-minute demo it seemed very comparable to the Vive. LG isn't messing around here. In terms of setup, LG's system is also similar to the Vive in that it uses the same SteamVR platform, including the room-scale technology. The headset, however, looks more like the PS VR with a similar plastic headstrap and lock mechanism. The big new feature here is that the goggles can flip up without having to remove the whole headset. This is going to be useful for developers who are constantly jumping in and out of VR when building games, but it'll be handy for the rest of us too. The wand controllers have a similar look to the Vive's, though the circular ends have morphed into elongated pentagons. The circular touchpad is back, but the system button has been moved just above it. LG said this was because people were often pressing it by accident on the Vive's wands, where it sits on the side. There are two buttons either side of that one, but this is all subject to change come the finished product. This thing is running SteamVR, so I was given a walkthrough of three familiar demos: Firebird – La Peri, a mo-cap ballet experience; Racket: NX, a racquetball game; and the longbow mini game from Valve's The Lab. Each looked and performed as well as they do on the Vive, but I felt like the headset was a little more comfortable, and the resolution may have looked a tad better at moments. Without a longer test, it's hard to tell. LG's Richard Taylor said the headset will be "similarly priced" to its competitors, the Vive and Oculus Rift, so expect something around the $700/$800 mark. This is a big deal for VR. It's the moment another serious player enters the arena and high-end PC VR stops being a bilateral affair. 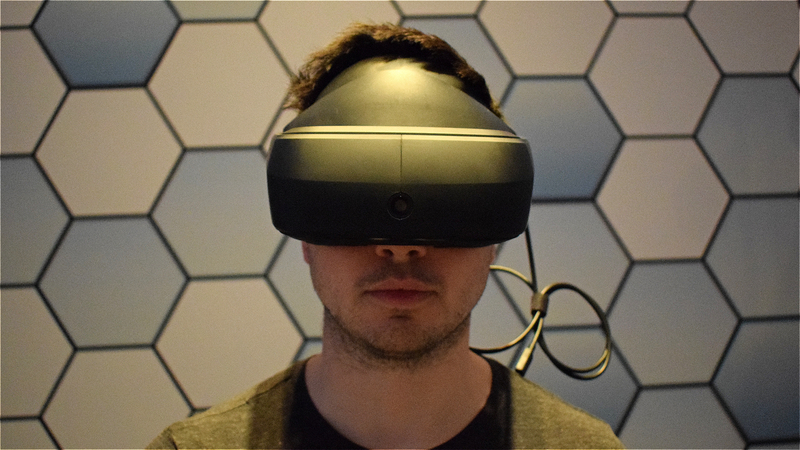 We have Microsoft's headsets to look forward to as well of course, but it's gunning for the "mixed reality" angle. I expect it won't be long before others start surfacing either; Valve promised more devices are in development, and I think more choice is only going to be a good thing. Valve's building an entire ecosystem here, and I can't wait to see how it plays out.